Fun and flirty, with elegance and style. This wrapper will bring just the right touch of whimsy to your celebration. 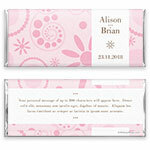 Design: Striking swirls, flowers and polka dots create a lovely pattern.